The new year is finally here, and it is time to spark some positive change in your life with resolutions for the year ahead! Now that the holidays have come and gone and all of the decorations are put away, it is time to tackle those goals for 2019 and get organized. Start with the kids' craft room and they'll be pleasantly distracted when you're ready to take on the rest of the house. Art supplies are always hard to keep organized. With paper, crayons and markers everywhere, it can be difficult to keep up with the clutter. The first step to success is to sort through the mess and toss any unusable supplies – dried out glue sticks, broken crayons and tiny scraps of construction paper can all be thrown out. Next, take all the useable craft supplies and start sorting like items together. It is important to create a system that works for everyone, and the Sterilite line of Clip Boxes are perfect for this! With multiple sizes for all those supplies, durable latches for secured transporting, and modular stacking capabilities to use every inch of space, it is sure to be the perfect fit in your home. The crafting chaos may be difficult to contain, but once you have a system in place, it will become more manageable! Crafts are a great activity to keep the kids entertained when trapped indoors on a snow day or a cold weekend. It is a great way for them to unleash their creativity and explore their imagination. Additionally, it is a welcomed alternative to watching TV or playing video games. Less screen time equals more creativity! 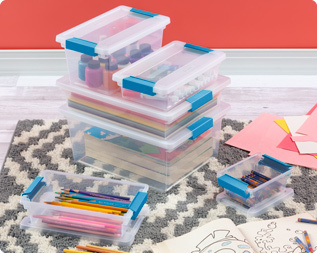 The Sterilite Clip Boxes offer a great storage solution for any crafting needs. The Mini Clip Box is ideal for smaller items, like crayons, which fit perfectly. The Small Clip Box is great for colored pencils, markers or scissors. For things that need to stand up like paint or glue, try the Medium Clip Box! Our Large Clip Box offers a perfect solution for notebooks and construction paper. It conveniently accommodates a full ream of 8½"x11" paper. Need a bigger option? The Deep Clip Box has you covered! It fits anything from coloring books to magazines and other large craft supplies. 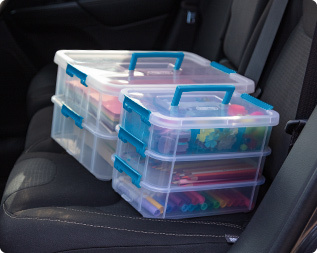 Whether you are taking a family road trip or just heading out the door with the kids, Sterilite's Stack and Carry boxes are the perfect on-the-go storage solution for all their crafting needs! The top layer of the box features a sturdy grip handle for easy carrying, and the latches securely lock each layer into place. The Stack and Carry 2 Layer Handle Box accommodates 8½" x 11" paper in each tier and can be used for transporting coloring books, construction paper or magazines. For smaller craft items, try the Stack and Carry 3 Layer Handle Box. It includes a removable divided tray that is perfect for all those small accessories such as pom-poms, stickers, glitter, and more. Happy Crafting and Cheers to 2019! 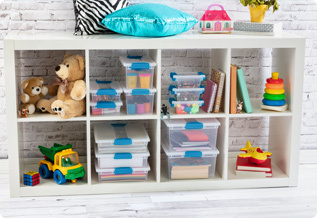 Organizing your home has never been easier thanks to the Sterilite Clip Boxes! They offer a clean and organized look in any room. With sizes ranging from mini to deep, Clip Boxes are ideal for storing anything from crayons to coloring books. Sterilite's Stack and Carry line offers the perfect on-the-go storage solution for all crafting needs!